Gusts of wind of up to 147km/h were recorded during yesterday’s Storm Ali. STORM ALI HAS continued to cause a number of flight disruptions today as over 80 flights were cancelled in Dublin Airport yesterday. Gusts of wind of up to 147km/h were recorded during yesterday’s Storm Ali, and air travel saw significant disruption throughout the day. 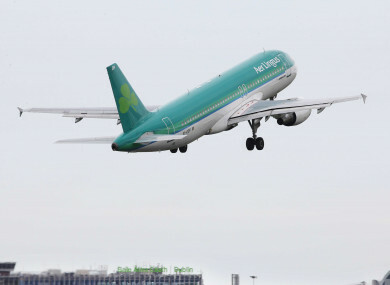 In a statement this evening, Aer Lingus said that “due to strong winds at Dublin Airport caused by Storm Ali, we experienced a number of cancellations and delays on our flight network yesterday”. It confirmed that over 80 flights had been cancelled across the Dublin Airport campus, by multiple airlines, causing “frustration and inconvenience to many thousands of passengers”. Yesterday, a Ryanair flight was forced to abort two attempted landings at Shannon Airport before diverting to Liverpool. Despite the departure of Storm Ali, Ireland has been hit with wet weather arriving from the south, which has been named as Storm Bronagh. Aer Lingus is today experiencing some “limited disruption” to its schedule as aircraft and crew are moved back into position. “We are advising guests to check the status of their flights before departing for the airport,” the statement said. The airline said that in the case of cancelled flights, affected passengers can opt to be accommodated on the next available flight, or cancel and apply for a refund. When appropriate, Aer Lingus said it provides passengers with meal vouchers and hotel accommodation. Information about passenger rights can be found here. Email “Flight disruptions continue after Storm Ali led to over 80 cancellations in Dublin yesterday”. Feedback on “Flight disruptions continue after Storm Ali led to over 80 cancellations in Dublin yesterday”.